A seasonal tradition brought over from Japan to America by Japanese-American farmers, making hoshigaki (as they're called in Japanese) is a fun outdoor autumn project you can do before the winter season really kicks in. Hang a bunch of peeled persimmons on a string outside, wait for three to five weeks, and harvest yourself some naturally dried persimmons during the winter months. Though peeling the fruit and then regularly massaging the fruit every few days after hanging may be more labor intensive than sticking a bunch of sliced fruits in a dehydrator, making your own hoshigaki makes for a truly unique seasonal activity. 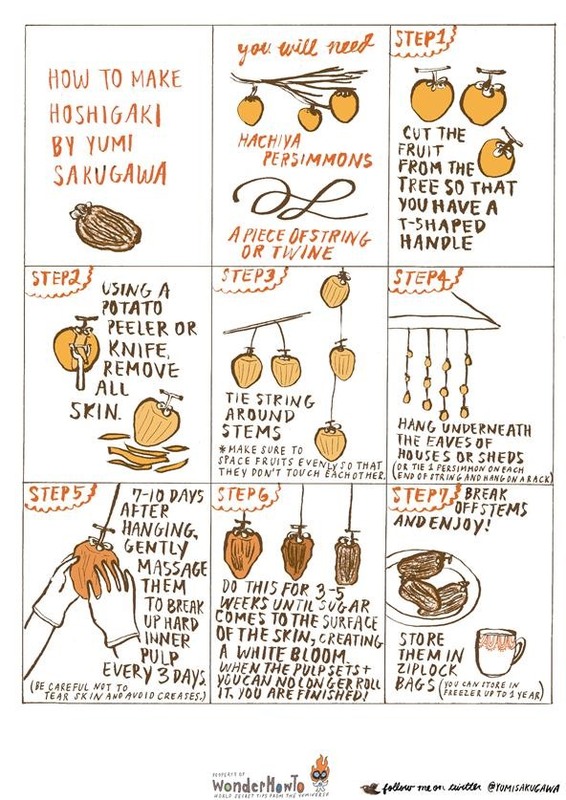 Use only hachiya persimmons, which are more pointed at the bottom. See if your local ethnic market has them, or if you have any family or friends with persimmon trees in their backyards. This seasonal project works if you start in October to November and end by January. It would work best in areas with cool to cold dry winter weather, and not in geographic areas with high humidity. I was inspired to do this because my mom does this herself every fall. They really are tasty and also just pretty to look at while they are hanging outside. You can also hang the string on a hanger and hang the hanger onto something outside. very cool. i've never heard of the process. If you live in California, can you do it all year round? I think it would still be best to do it in the October - January timeframe. That's also when persimmon trees bear fruit, and getting persimmons right off the tree while in season produces the best results. Do birds or bugs bother them when they are outside? Can they also be dried indoors? I've never heard of persimmons.... Cool! Thank you very much for your instructions and I love your step-by-step hand drawin instructions. I am going to try making it. I am so excited. I will send you a photo of the end product if you wish to see by sending me an email. Thanks again! I tried this for the first time last year, and they are so delicious I'm making more this year. Your graphic instructions are the clearest and simplest (and most beautiful!) in the entire internet. Thank you Yumi!